We accept Purchase Orders from companies for whom we have approved their credit, and the purchasing company has set us up in their purchasing system, what we call "Approved Purchase Orders". We can complete the set up process on our end in 3 to 5 business days. For your first order on a P.O. we require a hard copy be faxed to Cyndi Metz at 901-759-0941 or emailed to her using the Email Us button top center. Please note that our terms are net 30 days. We do not approve terms greater than net 30 days. If you have any questions, please feel free to call Cyndi at 901-759-0932. 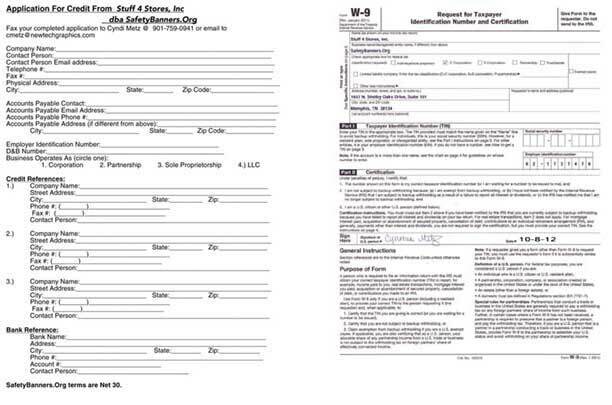 Click the form below to download our Credit Application and W9 as a PDF. NOTE: Our incorporated name is Stuff 4 Stores, Inc.
We are a "C" corporation, incorporated in the State of Tennessee. Today, we are Doing Business As (DBA) SafetyBanners.Org.